For those of you who don’t want to deal with a giant helmet dangling off of your bag or person all day, there’s FEND. This is a bicycle helmet that will fold up to a third of it’s original size, meaning you can pack it away when you’re not on your bike. 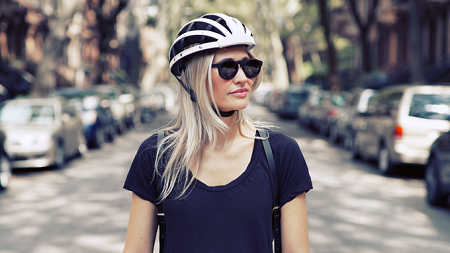 This doesn’t get you out of wearing it while you’re riding, but at least it won’t be as glaringly obvious that you ride a bike every other moment you’re not on it. This comes in white and black, and presently will cost you $89, which is a small price to pay for a combination of protection and the convenience of being able to fold up your helmet and stuff it in your bag. Since the design is streamlined, your head will also get a lot more airflow, making sure you don’t have to deal with scalp sweat. This hard ABS shell uses nylon straps with metal fixtures and has a multi-impact EPP liner, making it a pretty solid, classy accessory, but you still get the dorky-looking chin strap.